Our Castleford Ambassador from the SnoAcademy is 4 year old skier Jack Caygill. Jack started his journey with Snozone as a two year old on the Snozone SnoPlay activity. Currently on the 3 star award level, his favourite thing to do is a freestyle line of kickers and rails from the top of the slope to the bottom. Skiing is his favourite sport because he “gets to go really fast and has a lot of fun with the SnoAcademy coach”. Toby is 9 years old and is our Milton Keynes SnoAcademy Ambassador. Toby has already achieved the 5 star snow life award and is currently working towards his 6 star award. His favourite thing to practice is his 50/50 over a box. He loves trying out new freestyle features and his favourite drill to work on is doing full turns and spins down the slope. Our Snozone Disability Snowsports Ambassador for Milton Keynes is 12 year old Pollyanna, a below the knee amputee (on her right leg). 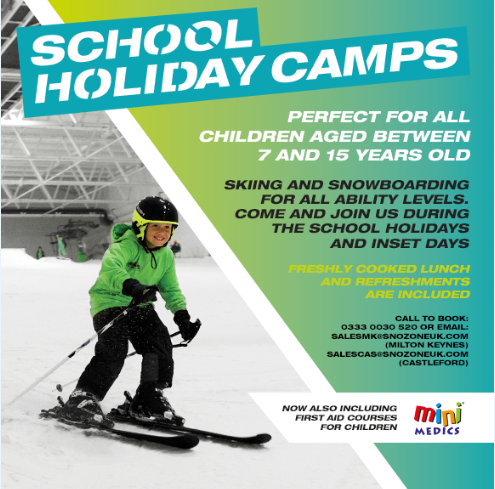 Pollyanna has taken part in lessons with the Snozone Milton Keynes Snowsports Manager Stephen and has shown a great passion for her new found sport. She uses one ski on her left leg, keeps her blade on her right leg and uses two stand up out-riggers to assist her with mobility, balance and steering. Previous Previous post: Autumn is here!